Fairs and festivals add vibrant colors to the incredibly stunning state, Rajasthan. 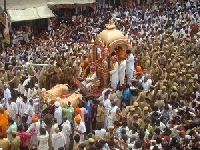 Numerous fairs and festivals are celebrated in Rajasthan. All the fairs and festivals feature display of the state’s legacy, colorful artifacts, lip- smacking delicacies, traditional Rajasthani attires, folk songs, folk dance and various interesting competitions. With its fairs and festivals, Rajasthan proudly presents its rich culture and heritage to the travelers. Tourists get an opportunity to witness different colors of the state through its festivities. This makes the tourists throng Rajasthan during the time of festivities. The calendar in Rajasthan remains dotted with colorful fairs and festivals and thus the state bustles with tourist activity, all round the year. Some popular fairs and festivals of Rajasthan include Mewar Festival, Camel Fair, Pushkar Fair, Kite Festival and Desert Festival. The locals of Rajasthan celebrate every fair and festival with a lot of fun and enthusiasm.